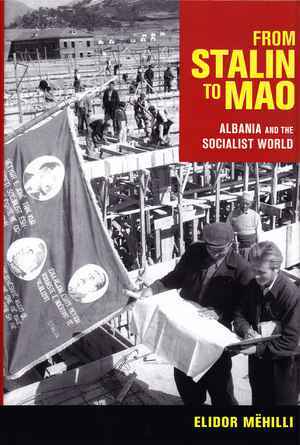 Elidor Mëhilli’s From Stalin to Mao is a history of Albania told through its connections to international socialism from Eastern Europe to China. Contributing to an evolving body of literature that has questioned the view that Westernization and globalization are one and the same, Mëhilli’s treatment of Albania provides a case study of socialism as a form of globalization in which Albania figures not as an isolated remnant of Stalinism but as a crossroads of inter-socialist connections and their discontents. The country may well hold the record for the most frequent and radical switching of allegiances in the socialist world. Emerging from the periphery of the Ottoman empire and fascist Italy (1939–1944), Albanian partisans and Communists led by Enver Hoxha took control of the country and steered it – increasingly under Hoxha’s personal control – into the orbits of Tito’s Yugoslavia (1944–1949), the Soviet Union (1950s), and China (1960–1976/78) before becoming one of the most isolationist states up until the end of the Cold War. Mëhilli does, however, not focus on how Albanian vassals changed patrons, nor does he lend credence to the idea that political shifts automatically led to radical ruptures in all the sociocultural realms. Instead, he juxtaposes the shifting sands of socialist alliances and rivalries with unexpected continuities, unwanted tensions and surprising disagreements within these dynamics. Rather than celebrating socialism’s utopian potentials or anti-imperialist solidarities, he portrays Albania through a wealth of layers and anecdotes as a lively “contact zone” (p. 10) where the “profound contradictions” and “unforeseen consequences” (p. 4) of socialist internationalism became visible. As a contact zone, Albania facilitated connections where there had been none before. Having had no historical ties to Russia, Albania serves an interesting case study for Stalinism as the result of the elite’s Cold War manoeuvring rather than military imposition. Mëhilli draws these perspectives together in a narrative about the emergence and development of Albania’s socialism in regional and transnational contexts. The narrative unfolds, more or less chronologically, in six chapters. The first chapter details Albania’s transition from Italian occupation in 1939 to its changing satellite status up to and after the Yugoslav-Soviet split. As in other parts of the book, Mëhilli details the interconnections and legacies by highlighting a particular theme. In this chapter, it is architecture and city planning. Communist authorities literally built on fascist infrastructure which had turned Tirana into an outpost of the expanding Italian empire. They made use of the command economy installed during the German occupation. The second chapter zooms in on Albania’s Sovietization as an expanding cultural horizon that was constructed through shared references to history, the establishment of friendship societies, the introduction of Russian as a foreign language and other devices that led Albanians to employ a “socialist lens” (p. 56) in their everyday lives. The new openings to the socialist world were, however, quickly followed by the observation that exchange meant both wanted and unwanted transformations. By the late 1950s, Albania’s leadership was highly concerned about students’ exposure to anti-Soviet and Western influences at universities in the GDR, Czechoslovakia, Hungary or Poland – and eventually withdrew some of the stipends to regain control about ideology. Chapters 3 and 4 give further insight into how socialism was translated, appropriated and negotiated across borders and by different groups, showing several levels of international cooperation reaching from government negotiations over projects such as the establishment of a textile mill to relations between Albanian personnel and Eastern European specialists who had their own personal (sometimes pecuniary) motives in coming to Albania in the 1950s. Here, Mëhilli draws a number of conclusions that are applicable beyond the Albanian case. Departing from the assumption that the transmission of “socialist experience” is best thought of as an “emerging field of interaction” (p. 132), he shows that exchanges often instilled a new sense of belonging, but rarely led to unity and understanding. To the contrary, they “brought to the surface cultural prejudice and feelings of technological superiority, which socialism was supposed to eradicate but which were impossible to ignore.” (p. 157) This double-edged character of exchanges – highlighting differences in efforts to overcome them – was further complicated by the open question of defining socialist content: What exactly was it that made Soviet methods “Soviet” and “socialist”? Of what use was a Bulgarian manual or an East German patent? Often, such questions were left unanswered, which provided ample room for manoeuvre. Chapter 5 returns to matters of migration and urbanization and compellingly argues that the broader (i.e., regional or perhaps even global) trend of socialist architecture towards cost-saving standardized production of pre-fabricated buildings was only one part of the story. Construction works in Albania continued to be an amalgam of local practices and central planning as the latter influenced but did not determine what happened on building sites. The career trajectories of Albanian architects – trained in the West before the Communist period, later on in the East – illluminate both the diplomatic ruptures and intellectual and cultural continuities across the ideological schisms. Chapter 6 details how Hoxha, troubled by Soviet de-Stalinization and the patron’s increasing pressure to get back into the ideological line, turned towards China. Sandwiched between Vietnam and North Korea, Albania ranked second on China’s list of aid recipients in 1965. The Soviet era, however, lingered on as Sino-Albanian relations initially relied on Russian, the Communist realm’s lingua franca. Mëhilli’s analytical focus branches out quite far. A broad range of issues, including labour relations, Albania’s Third World contacts, women’s liberation or religion, is touched upon. While this provides the reader with a compelling panoramic view, the analytical value of the conclusions drawn from these short glances is often limited. An example of this is the treatment of transfers of resources, experiences and models in the economic realm. The reader learns that both Soviet and Albanian political elites agreed that factories and a modern, industrial workforce were prerequisites and marks of modernity. They disagreed, however, on Albania’s distance to that modernity. Stalin and other Soviet leaders repeatedly warned against copying Soviet-style rushed industrialization and urged Enver Hoxha to invest in agricultural production instead. For Hoxha, however, the possibility of fast-forwarding to an industrial future was key to why the Soviet experience was attractive which is why he demanded credit and technical support first and foremost to establish factory complexes. Although the Soviets (and, later on, the Chinese) were frustrated by these repeated demands, they apparently gave in – but it remains unclear why. The engagement with competing strategies to overcome peripherality might have deserved a more rigorous treatment. In terms of sources and source criticism, Mëhilli proceeds with both impressive width and minute attention to detail. He uses newly declassified files from Albanian ministries as well as records of Italian, British, Soviet and East German engagements with Albania and autobiographical writings and novels, which enable him to explore and articulate multiple perspectives. Many protocols and reports, the reader learns, were “transcripts of wishful thinking” (p. 176). Even with multiple perspectives, knowledge transfers remain hard to pin down. Instead of solely asking for the results of interactions, Mëhilli foregrounds the processual character of transfers with all their intricate issues of translation, appropriation, and strategic deployment of terms and techniques. Similarly, reports and letters are not simply taken at face value but insightfully questioned for their purposes and distortions (e.g. pp. 86–87, p. 94, p. 129). It is both rewarding and challenging that Mëhilli frequently changes his lenses and blends sections on high politics with musings about a certain building or an East German architect’s journeys from Albania and India to Zanzibar. There is a lot to take away from this monograph, even if some readers might dislike its slightly anti-communist tone or end up frustrated failing to identify a major argument apart from repeated claims about the contradictory character and complexity of the processes under scrutiny. Transcending national history, offering glimpses into the lives of party leaders, expatriate experts and peasants and bringing forward many stimulating thoughts, From Stalin to Mao is a significant contribution to the emerging body of scholarship on transnational history of communism. It contextualizes Albania’s increasing isolation from the 1960s onwards as the (unexpected) result of intense cross-border interactions and demonstrates how the joint treatment of social, political and cultural themes greatly enhances our understanding of socialism both nationally and internationally. From Stalin to Mao will be of interest not only to those interested in Albania’s trajectory but also to scholars of the Cold War, Eastern Europe, socialisms and development more broadly. Eric Burton: Rezension zu: Mëhilli, Elidor: From Stalin to Mao. Albania and the Socialist World. Ithaca 2017 , in: Connections. A Journal for Historians and Area Specialists, 15.03.2019, <www.connections.clio-online.net/publicationreview/id/rezbuecher-28802>.